"It's just an ordinary pen. Looks like a pen, writes like a pen, and listens like a pen." 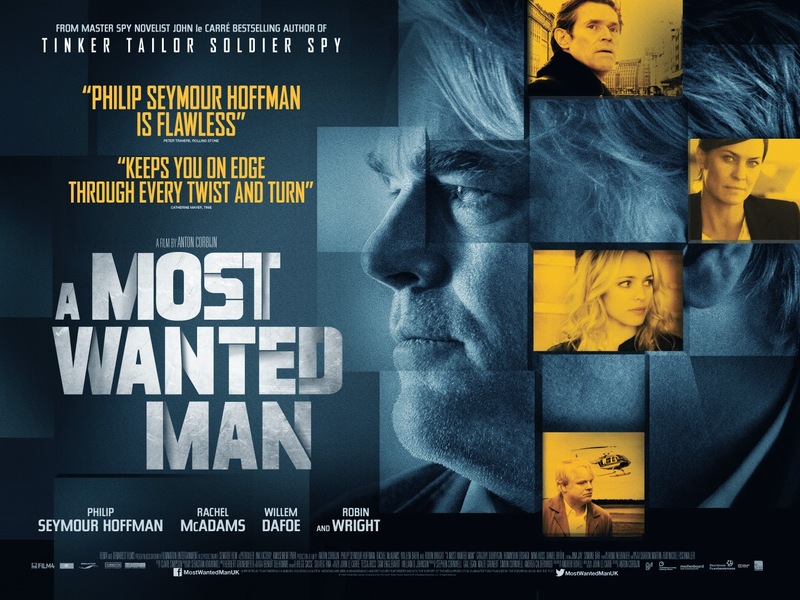 A Most Wanted Man is a dramatic thriller with the blood of espionage running through its veins. As the latest directorial effort from Anton Corbijn, who last brought us The American with George Clooney, there's a sense in which his new film could accurately be retitled The German. Like the director's previous entry, this one is more focused on character than action. The film is an adaptation of a John le Carré novel, whose work also provided the basis for the British masterpiece Tinker Tailor Soldier Spy, and it features the last lead performance of the late great Philip Seymour Hoffman. But despite its admirable intentions and generally successful execution on the surface, I was ultimately disappointed by its inability to intelligently confront the subject matter it presents. Günther Bachmann (Hoffman) is a German intelligence agent working as part of a team tasked with tracking movements in the Muslim community in an effort to foresee and prevent acts of terrorism (a problematic association the film never acknowledges). Bachmann suspects a wealthy man named Abdullah (Homayoun Ershadi) of laundering money and potentially funding anti-German forces, and beings investigating his connections with the mysterious Seven Friends shipping company. But his well of leads is running dry, and administrative pressures build when foreign liaison Martha Sullivan (Robin Wright) pushes him to get tangible results and threatens to compromise his carefully orchestrated plan. Meanwhile, a young Chechen refugee Issa Karpov (Grigoriy Dobrygin) enters the country seeking asylum and is taken under the wing of Annabel Richter (Rachel McAdams), an idealistic immigration lawyer. Together they investigate Karpov's inheritance through the semi-corrupt banker-for-hire Tommy Brue (Willem Dafoe); but when it turns out Issa wants to get rid of his father's dirty money, Bachmann finally sees the opportunity he needs to catch Abdullah in the act. Like the majority of spy thrillers, A Most Wanted Man weaves a tangled web of interconnected characters and events. It's a far cry from the James Bonds and Jason Bournes of the cinematic universe, however, as Corbijn plays the story for its dramatic tension rather than its body count. The resulting investigation into the business end of espionage provides a much more subtle perspective of the lonely, frustrating profession. The film has a languid and ponderous pace which distinctly recalls the atmospheric intensity of Tinker Tailor, both for better and for worse. The good news is that it's playing the right kind of game, with the spotlight only leaving Hoffman's character when it needs to move the story along; the bad news is that it can't compete with the other players in its league. The story is complex and well constructed, but it plays out at a deathly slow pace, and the twists are all too often delivered through dry exposition with little if anything tying it back to characters. As a result, the majority of the weight of the film is carried by the performances of its cast. And fortunately the two central performances are thoroughly captivating: Hoffman's Bachmann is intensely world-weary and communicates an incredible gravitas, and Dobrygin's Karpov is the perfect blend of fear for this new country he doesn't understand and determination to maintain his honor and principles. The problem is that the film constantly flip-flops in the realism of its representation of Germany. Scenes are clearly shot on location in Hamburg, but the actors constantly struggle with their German accents. Even when the accents aren't distracting (which they are far too much of the time), there are jarring moments of dissonance where (for instance) actors read a German newspaper headline in English. These problems are small in the grand scheme of things, but they constantly threaten to derail a narrative which relies so heavily on performances, and they generally make the film less immersive than it ought to be. Although the material is a bit bland and barely rises above the bar set for your average spy flick, Corbijn livens it up a little with some stylistic flair. He shows influences from both classic and modern film noir, with the characters' corrupt intentions reflected in the dark shadows of the city's seedy underbelly. In contrast, the film has a very vibrant color palette which alternates primarily between yellow and blue and creates a thick atmosphere of fear, anxiety, and cowardice. This color scheme is far from original (even Michael Bay uses it), but it's ubiquitous for a reason and it serves its purpose well enough. Occasionally, scenes which ought to be steady are shot on handheld (a trend I will be happy to see finally disappear), but otherwise the film looks nice from a simple aesthetic perspective. The most interesting aspect of the film—and sadly the one which it seems most hesitant to confront directly—is its portrayal of international politics in our post-9/11 intelligence community. The most it ever gets out of this premise is the position that the United States is a careless and aggressive international intruder. This is certainly a compelling and relevant statement to make, but the film never goes anywhere with it. Bachmann executes his plan, US diplomats make various attempts to take over and derail his careful planning, and the ending shows on which side of this simple conflict it thinks we should be. Captain America: Winter Soldier was a more political film. This is a political thriller without the politics. A Most Wanted Man seems content with being subdued and vaguely atmospheric with some compelling central performances, and while that's certainly enough to carry it from start to finish, it could have been so much more.